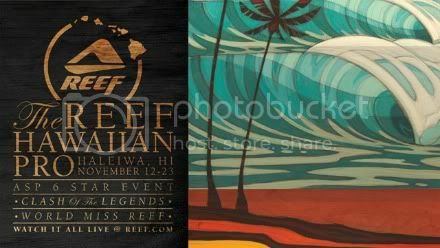 Reef Hawaiian Pro runs November 12th - 23rd at Haleiwa (Alii Beach Park) on the North Shore of Oahu. 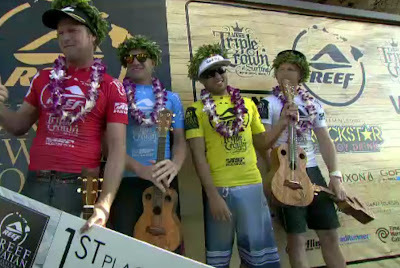 The event is the first jewel in the Vans Triple Crown of Surfing 2011. Stu Kennedy surfs in Ht 6 round 2 and Adam Melling starts in Ht 12 round 3. Good luck fellas. The first several days of the waiting period will be very small/flat at Haleiwa with only minimal pulses of Northeast and Northwest swells. The latter half of the waiting period will be a little better with a small series of northwest swells from the 17th - 21st. A bit of a bumpy start to his 2011 Hawaiian campaign but Mello came back from an interference at the start of the heat to post a win and move into round 4. Unfortunately Stu couldn't find the right waves in the small tricky conditions and was eliminated in 33rd with 700 points. In round 4 and his quarter final Mello stayed busy and unleashed his power game to progress in the inconsistent conditions. The semi final was a nail biter which saw Mello hold on to 2nd place after Bourez needing a 5.29 took off just before the hooter and throw it up there a couple of times but only scoring 4.63. In the final Taj got off to a massive lead which left Mello battling De Souza for 2nd. Adam got his highest score of the final just before the hooter and secured 2nd place plus 5200 points. Adam is now No.29 on the ASP Men’s World Ranking. Congratulations mate. “I am feeling pretty good you know, always wanted to do well and get on the podium here in Hawaii because the waves are so testing. You can get any kind of conditions. You can get one foot or 12-foot closeouts. I needed to podium this year, I need the points so bad. I have been on the borderline for a while now, so hopefully this can push me up and I can get a couple more results.